The announcement signals a shift in US policy and comes ahead of the Israeli Prime Minister’s planned visit next week to the White House. The administration has been considering recognising Israel’s sovereignty over the Golan, which Israel captured from Syria in 1967. Last week, in its annual human rights report, the State Department dropped the phrase “Israeli-occupied” from the Golan Heights section, instead calling it “Israeli-controlled”. “After 52 years it is time for the United States to fully recognize Israel’s Sovereignty over the Golan Heights, which is of critical strategic and security importance to the State of Israel and Regional Stability!” Mr Trump tweeted. In addition to its policies towards the Palestinians, the US has taken a hard line towards Iran, much to Mr Netanyahu’s delight. Mr Trump’s announcement came as Secretary of State Mike Pompeo is in Jerusalem, lauding warm ties with Israel and promising to step up pressure on Iran. Mr Pompeo’s words gave a public boost to the Israeli leader at the height of a tight re-election campaign. Mr Netanyahu is to be in Washington for two days next week – two weeks before Israel’s April 9 ballot. Standing together in Jerusalem, neither Mr Netanyahu nor Mr Pompeo mentioned the heated Israeli election campaign. But Mr Netanyahu, facing a tough challenge from a popular former military chief and reeling from a series of corruption allegations, has repeatedly sought to focus attention on his foreign policy record and strong ties with Mr Trump. Mr Pompeo has said his trip has nothing to do with politics. Mr Netanyahu thanked Mr Pompeo for the Trump administration’s strong stance against Iran, which Israel regards as an existential threat. Mr Netanyahu has accused Iran of attempting to set up a terrorist network to target Israel from the Golan Heights, using the incident to repeat his goal of international recognition for Israel’s claim on the area. “You could imagine what would have happened if Israel were not in the Golan,” he said. Mr Pompeo paid a solemn visit to Jerusalem’s Western Wall along with Mr Netanyahu in an apparent sign of support for Israel’s control of the contested city. 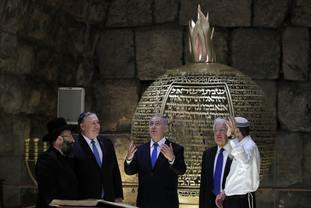 Mr Pompeo is the highest-ranking American official to tour the holy site with any Israeli leader. His visit was likely to further infuriate the Palestinians, who have already severed ties with the US over its Jerusalem policies. Mr Pompeo and Mr Netanyahu prayed at the wall, the holiest site where Jews can pray, before depositing written prayers in its crevices and then touring nearby tunnels and a synagogue. Neither made any public comment at the site. Mr Pompeo said he thought it was important to visit the wall with the Israeli leader as a show of support for Israel. “I think it’s symbolic that a senior American official go there with a Prime Minister of Israel,” he said before making the trip. Israel captured east Jerusalem and the Old City in the 1967 Middle East war, and for decades US officials refrained from visiting the Western Wall with Israeli leaders to avoid the appearance of recognising Israeli sovereignty over the city’s most sensitive holy sites. The Palestinians seek east Jerusalem as the capital of a future state. But the Trump administration has upended the longstanding policy, moving the US embassy to Jerusalem last year after recognising the city as Israel’s capital. Israel claims all of Jerusalem as its eternal and indivisible capital. Senior US officials, including Mr Trump and numerous predecessors, have visited the wall privately in the past, but never with an Israeli leader. The Old City is home to Jerusalem’s most sensitive holy sites, including the Western Wall and the Church of the Holy Sepulchre, where tradition says Jesus was entombed and resurrected. Mr Pompeo, a devout Christian, also stopped at the church. Next to the Western Wall is a hilltop compound revered by Jews as the Temple Mount and by Muslims as the Noble Sanctuary. The spot, which once housed the biblical Temples, is the holiest site in Judaism and today is home to the Al-Aqsa Mosque, the third-holiest site in Islam. When Mr Trump recognised Jerusalem as Israel’s capital, he said it did not determine the city’s final borders. But the gesture was perceived as unfairly siding with Israel and prompted the Palestinians to sever ties with the US. The Palestinians have already rejected a planned Middle East peace initiative by the administration. Nabil Abu Rudeineh, spokesman for Palestinian President Mahmoud Abbas, said Mr Pompeo’s visit added additional obstacles to peace hopes. “While they are claiming to be trying to solve the conflict, such acts only make it more difficult to resolve,” he said. While previous secretaries of state have traditionally met with the Palestinians when visiting the region, Mr Pompeo has no such talks planned. “The Israelis and Palestinians live side-by-side. We need to help them figure out how to do that,” Mr Pompeo said. In addition to the Jerusalem recognition, the administration has also cut hundreds of millions of dollars in aid to the Palestinians, helping fuel a financial crisis for Mr Abbas’s Palestinian Authority. At a meeting with Mr Pompeo, Israel’s President Reuven Rivlin expressed his deep concern about the Palestinians, both in the Hamas-ruled Gaza Strip and under the internationally backed Palestinian Authority in the West Bank. “If the Palestinian Authority will collapse, we will have to take care about what is going on,” he said.